The True Meaning Behind The Pope's Rejection Of God As 'Magician' : 13.7: Cosmos And Culture Adam Frank reflects on the pope's statement through a talk with Jesuit priest and astronomer George Coyne, who he says may represent the beginnings of a true dialogue between science and religion. For many, the pope's remarks pointed to a far more subtle perspective on God, science and universe than we, in the U.S., are used to hearing. 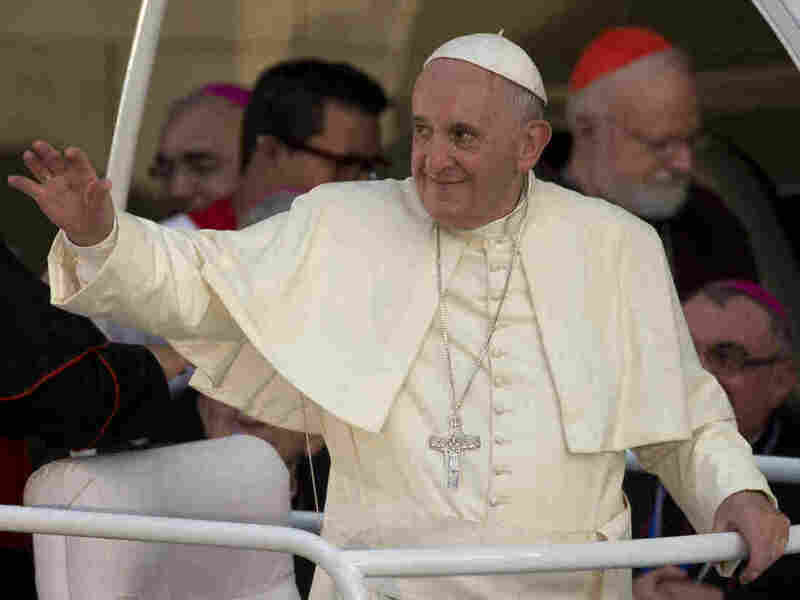 After decades of sitting through tiresome "debates" with creationists who happily use the fruits of science only to ignore the parts which offend their particular readings of scripture, the pope's blunt statement seemed like a breath of fresh air. All of a sudden there seemed to be opportunity for a truly interesting discussion about science and religion. So, to that end — and in honor of Pope Francis' visit — it's time to ask the big question: What did the Pope mean with that whole "God's not a magician" thing? "When we read the account of Creation in Genesis we risk imagining that God was a magician, complete with an all powerful magic wand. But that was not so. He created beings and he let them develop according to the internal laws with which He endowed each one, that they might develop, and reach their fullness." As many have noted, when it comes to evolution, the pope was simply stating what the Catholic Church has accepted for quite some time: Evolution happened and it's a not a problem for religious people. As Pope John Paul II said 1996, "New findings lead us toward the recognition of evolution as more than a hypothesis ... The convergence in the results of these independent studies constitutes in itself a significant argument in favor of the theory." But, as with much about Pope Francis, there seemed to be something in his language that implied more than just acceptance. There seemed to be engagement. So, to understand the Pope's balance of religious impulse and scientific reason more deeply, I turned to someone who is intimate with the question. George Coyne is an astronomer who has studied everything from stars to galaxies. He is also a Jesuit priest. In his career, he has been both the director of the Vatican Observatory and the assistant director of the University of Arizona's Steward Observatory. When it comes to science and religion, Coyne is clearly a man in the know. When I contacted him to ask about the pope's perspective, he replied with answers that were thoughtful, articulate and charming — even if I could not agree with them all. "The religious believer is tempted by science to make God 'explanation.' We bring God in to try to explain things that we cannot otherwise explain. 'How did the universe begin?,' 'How did we come to be?,' and all such questions. We sort of latch onto God, especially if we do not feel that we have a good and reasonable scientific explanation. He is brought in as the Great God of the Gaps." "One gets the impression from certain religious believers that they fondly hope for the durability of certain gaps in our scientific knowledge of evolution, so that they can fill them with God. This is the exact opposite of what human intelligence is all about." "The Bible is a collection of writings by various authors at various epochs using various literary genres. And so it best serves reason if one speaks of a specific book rather than of the Bible in general. It is clear that the overall intention of the authors of Genesis is to evoke religious faith, an adherence to the God of Abraham, Isaac and Jacob, and not to teach science. There is simply no scientific teaching in Genesis." The mistake being made by so many is, according to Coyne, using God to fulfill a need (for explanation). But as he sees it, "In fact, to need God would be a very denial of God. God is not the response to a need." It's here that Coyne begins to unpack a very different approach to the discussions of science and religion than we usually hear in the media. "I have never come to believe in God, nor do I think anyone has come to believe in God, by proving God's existence through anything like a scientific process," he says. "God is not found as the conclusion of a rational process like that. I believe in God because God gave himself to me. That was not a miracle. It does make sense that there is a personal God who deals with me and loves me and who has given himself to me. I have never come to love God or God to love me because of any of these reasoning processes. I have come to love God because I have accepted the fact that he first made the move towards me. While reasoning has not been adequate to this experience, I find that it is profoundly coherent with all that I know by reason, including science. In fact, it is not only coherent but my scientific knowledge enriches that experience." Many atheists and agnostics may find Coyne's emphasis on such personal experience either unconvincing or unnecessary. I do find that it helps me understand how he, or even the pope, balance their faith and their respect for science. While I may not agree with ontologies lying below such statements, I can understand the deeply felt aspirations which animate them. Most importantly, they represent a perspective that is nuanced enough to allow for a real dialogue between religion and science — one that is actually interested in open questions about the world and the experience of being human, rather than just scoring points with your audience. "For those who believe, modern science does say something to us about God. It provides a challenge, an enriching challenge, to traditional beliefs about God... Is such thinking adequate to preserve the special character attributed by religious thought to the emergence not only of life but also of spirit, while avoiding a crude creationism? Only a protracted dialogue will tell." If this is the kind of dialogue the pope seems to be interested in, then — even with my disagreements — he can count me in.